Noted For: Casper the Friendly Ghost, Baby Huey, Little Audrey, Herman & Katnip. smaller producer's debts and took the production in-house. The Famous Studios cartoons were not lively, not innovative, never zany. What they were was profitable. But what more does a corporation want? At first, the Famous output resembled Fleischer's, at least outwardly. But within a year, differences started mounting. The Popeye cartoons were produced in color — a surface improvement, although they quickly became more formulaic than before. The Superman license was dropped, replaced by Little Lulu — less spectacular and more in keeping with an increasingly cute, kid-oriented product. No more features were produced, or even contemplated — Disney may be able to make such daring leaps work, but Famous stuck with the tried and true. 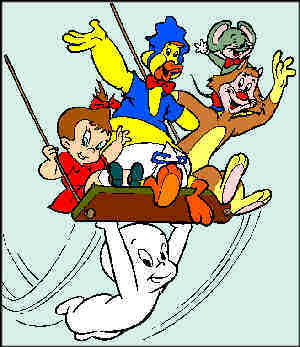 In 1945, Famous introduced its first successful new character, Casper the Friendly Ghost. It was also the only one they ever did that could reasonably be called original. Casper was followed by Baby Huey (which closely resembled Warner Bros.' Three Bears, a minor Chuck Jones series) and Herman & Katnip (a clone of MGM's Tom & Jerry). They even cloned Little Lulu as Little Audrey, apparently figuring it didn't matter what the little girl's name was; they could do just as well with their own, and not have to pay licensing fees. They showed the same attitude toward their own characters. In 1949, they licensed their characters out to comic books. Ten years later, they sold those characters outright to the current licensor, Harvey Comics, and simply made up new ones. But just as Audrey never became as big a star as Lulu, their new characters — Honey Halfwitch, Jeepers & Creepers, Nudnik and suchlike — never achieved even the modest success of the ones they'd sold. In 1962, they tried one last bout of licensing. Their Comic Kings series used a few King Features characters, including Beetle Bailey and Krazy Kat. But these failed to capture the wit and charm of their newspaper counterparts, and were quickly abandoned. Famous Studios' last effort to stay in the shrinking theatrical cartoon market was in 1966, when they hired Ralph Bakshi, whose training had been at Terrytoons, to head up the studio's creative end. But by that point, even high-quality, more market-savvy producers, like Warner Bros. and MGM, were moving out of theatrical cartoons. Famous Studios gave up the ghost in 1967. Text ©2000-07 Donald D. Markstein. Art © Harvey Publishing.